1) On the schedule page, find the call sheet you want to see confirmation details for. Click the options dropdown for that call sheet and choose “View Confirmations”. 2) Select one or more people who you wish to remove and then click the “Remove Access for Selected” button in the header bar. 3) A confirmation popup will appear. 4) Click the “Remove Access” button to confirm the removal of the selected people from this call sheet. 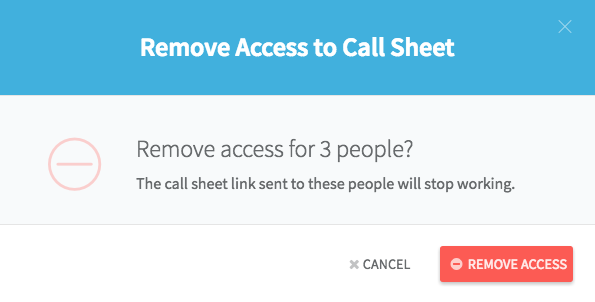 When you remove someone’s access to the call sheet, the call sheet link that was shared with them will no longer work. However, if you included a PDF attachment of the call sheet when originally publishing, keep in mind that the recipient will still be able to access that email’s PDF attachment, even after you’ve removed them from the access list.